Today, you will learn how to scaffold a React Single-Page Application (SPA) with some sensible and opinionated defaults. Probably, you heard of create-react-app before and, probably, you are even using this tool to scaffold your React apps. So, you may be wondering: "Why would I need to read this article and how does it help me?" and that uses Auth0 to handle authentication easily. can handle state and asynchronous tasks (like timeouts and AJAX requests) easily. If that sounds interesting, keep reading! 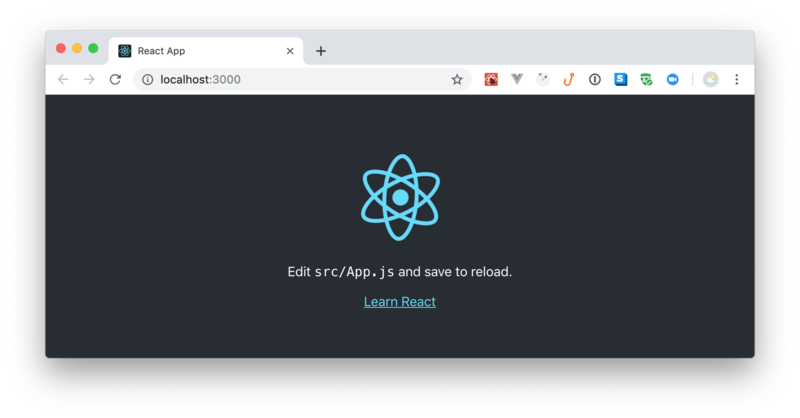 "Learn how to integrate Redux Saga, React Bootstrap, React Router, and more in your next React app." To follow along with this article, you will need Node.js and NPM installed in your machine. If you don&apos;t have these tools, please, check this resource before continuing. On most installations, Node.js ships with NPM. Besides that, you will have to have some basic knowledge of React. You don&apos;t need years of experience with it to follow the article along with, but you do have to understand its basic principles (components, JSX, etc.). If you are completely new to React, please, read this article first. After reading it, you will be able to read this one without struggling. In this article, you will build a very simple to-do list manager application. Your app will consume a to-do list from an external server and will allow users to add new to-do items to the local list. However, the app will not update this external server with the new items that users insert. The goal of this article is not to build the application, but to teach you how to put everything together so you can build awesome React apps that rely on a mature architecture. This command will make NPM (or Yarn if you have that available) download the latest version of create-react-app and execute it to create your project under a new directory called react-todo. After running this command, move into the new directory (cd react-todo), and run npm start to see your new app. If everything works as expected, NPM will open http://localhost:3000 for you in your default browser. Note: Throughout this article, you will see npm commands everywhere. However, if you have Yarn installed in your machine, create-react-app will use it instead of NPM to scaffold your application. If that is the case, you will have to translate npm commands to yarn (e.g., instead of running npm start, you will need to execute yarn start), or you will have to remove the yarn-lock file and issue npm install to create the package-lock.json file for you. Feel free to choose whatever suits you better. All software developers have their own preferences when it comes to code style. Some prefer using semicolons, and some prefer leaving them out. Some prefer indenting code with tabs, and some prefer using two spaces. However, what is really important is that they don&apos;t mix these different styles on a single code base. To easily accomplish that, you will use Prettier. Prettier, as explained by their website is an opinionated code formatter that you can use to help you keep the code style of your project consistent. If you configure Prettier properly, any software developer will be able to jump right into your project and start coding without worrying about code format. Then, when they save their modifications (or when they commit them), Prettier will make sure the code is formatted correctly. Sounds cool, right? husky and lint-staged: Together, these libraries will allow you to register an NPM script as a githook (this way Prettier will run right before the developer commits a new code). The first property, husky, will make lint-staged run on Git&apos;s pre-commit phase. The second property, lint-staged, indicates what exactly NPM must run on this phase. The third property, prettier, changes the default configuration of Prettier to use singleQuote instead of double quotes. For example, if you are using WebStorm, you will have to install this plugin. Then, after installing it, you can use the Reformat with Prettier action (Alt + Shift + Cmd + P on macOS or Alt + Shift + Ctrl + P on Windows and Linux) to format the selected code, a file, or a whole directory. Also, you might be interested in adding a WebStorm File Watcher to executes the Reformat with Prettier action on file modifications. If you are interested in this, please, check this resource. After configuring Prettier into your project, the next thing you can do is to install and configure React Bootstrap. This library is a specialization of the Bootstrap toolkit. As Bootstrap depends on jQuery to run some components, the React community decided that it would be a good idea to remove this dependency and rebuild Bootstrap to integrate with React tightly. That&apos;s how React Bootstrap was born. If everything works as expected, you will be able to see a page with a header (h1) and a Button that use Bootstrap&apos;s CSS rules. Note: You are not using two files anymore: ./src/App.css and ./src/logo.svg. As such, feel free to delete them. Next, you will install and integrate Redux in your React app. Redux, for those who don&apos;t know, is the most popular state management library among React developers. Redux itself is not tied to React but, most of the time, developers use them together. If you don&apos;t know how Redux works, don&apos;t worry, you can still follow along with this article. In the end, you can read this practical tutorial on Redux to learn more about this library. The first one, redux, is Redux itself and the second one, react-redux, is a library that offers React bindings for Redux. Here you are defining that, for now, your app will handle a single type of action: ADDTODO. Actions of this type, as you can see, will carry a toDoItem object with two properties: an id and a title. This file has two goals. The first one is to define the initialState state of your app (which is an empty toDoList). The second one is to define what the toDoApp will do when it receives an ADD_TODO action (which is to include the new to-do item to the toDoList). The new version of this file is using the createStore function (provided by redux) to create a single source of truth object about the state of the app (i.e., the store constant). Then, it uses this store to feed the app with state. ./src/components: This is where you will create your Presentational Components (that is, components that are not aware of Redux). ./src/containers: This is where you will create Container Components (that is, components that tightly integrate to Redux). This component will present a form to your users and will allow them to input (and submit) new to-do items. As you can see, when your users submit this form, the component will dispatch an action that the addToDo function creates. This is enough to feed your app with to-do items but is not enough to present the items to your users. To be able to present the to-do items, you will create two Presentation Components: ToDo and ToDoList. As their names state, the first one will render a single to-do item, while the second one will render a list of to-do items. This component will receive the description of the to-do item in question and will use the ListGroup.Item Bootstrap component to render the item. This component will receive the toDoList, iterate over it, and render (inside a Jumbotron Bootstrap component) a list of ToDo components. This will make sure Redux maps the toDoList object available on its store (the state object on the source code above) to the toDoList property that the ToDoList presentational component uses. Now, to see Redux in action, rerun npm start from the terminal. If everything works as expected, you will see your new to-do app up and running in your browser in a few seconds. There, you will be able to use the form to insert new to-do items. Cool, you now have an application that can rely on a single source of truth when it comes to state management. However, one big gap of Redux is that this library does not handle well side effects (like those that AJAX requests provoke). To be able to handle this kind of side effect, you can use Redux Saga. The goal of this article is not to teach everything about Redux Saga. For that, you can check this tutorial. However, even if you are not acquainted with this tool, you can still follow the instructions here to put the whole thing together. Then, when you finish reading this article, you can dive into this useful (and excellent) topic. This will install the redux-saga dependency in your React project. LOADTODOLIST: This action type will make your React app load the to-do list from an external server. RENDERTODOLIST: This action type will make your React app render the to-do list it just loaded. Besides that, you are defining a function called loadToDoList to create an action with the LOADTODO_LIST type. In a few moments, you will make your React app use this function to dispatch an action of this type. Here, you are adding a new case statement to the switch command that will handle RENDERTODO_LIST actions. When your Redux receives an action with this type, it will read the toDoList payload and update the state of the app with the new list. fetchToDoList: A saga that issues a request to a backend API (a static JSON file in this case) to fetch a toDoList. loadToDoList: A saga that listens to LOADTODOLIST actions to trigger the fetchToDoList saga. When the fetchToDoList saga finishes loading the data from the API, it dispatches (through the put function) a RENDERTODOLIST action with the new list of to-do items. Then, the new version of your reducer captures this action and updates the state of the app accordingly. Here, you are creating a sagaMiddleware to add to your app&apos;s store and you are making your app use the loadToDoList action creator to dispatch an action. If you get everything right, you will see that your React app now loads two to-do items from the remote server: one to remind you to "buy pizza" and another one to remind you to "watch Netflix". "Redux Saga makes it really easy to manage side effects caused by process like async HTTP calls." and managing side effects that things like async HTTP requests cause (with the help of Redux Saga). What you need now is to prepare your app to handle multiple routes. For that, you can use React Router, a declarative routing library for React. As you can see, this component creates two instances of Link: one that allows users to navigate to your home page (i.e., /) and one that allows them to navigate to a route where they will insert to-do items (/new-item). For demonstration purposes, you will split the form from the to-do list. Here, you are using the Route component to configure your app to render the ToDoListContainer component when users navigate to your home page, and to render the AddToDo component when they navigate to /new-item. 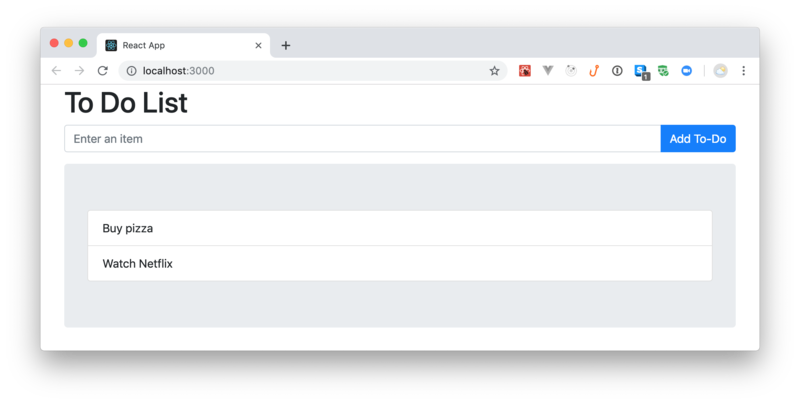 With that in place, you can rerun your application (npm start), and see the navigation feature working in your browser. Your architecture is almost complete now. You have installed and configured some useful libraries that help you handle navigation, state, and the user interface. However, you haven&apos;t done anything related to facilitating the enhancement of this user interface. For example, what if you wanted to change the style of your buttons? Or if you want to add some margin between your Navigation component and the list of to-do items? You could, of course, write a simple CSS file and import it in your React app. But this is old school. In the new version of this file, you are using styled-components to create a component called NavigationBar that is a div with some CSS styles. More specifically, you are defining that this div will have 15px of margin on its bottom and that it will have a lightgray background. As you can see, you use the new NavigationBar component just like other components (or DOM elements). That&apos;s it! With that in place, you can rerun your app (npm start), and check the new layout in your browser. Lastly, you will have to think about securing your application. For that, you will use Auth0. You can&apos;t go too far without a good identity management system backing you up. You could, of course, build your own solution but, besides having to implement everything from the ground up (user registration, email confirmation, password reset, etc. ), you will never have a solution that is as trustworthy as Auth0. Auth0, a global leader in Identity-as-a-Service (IDaaS), provides thousands of customers in every market sector with the only identity solution they need for their web, mobile, IoT, and internal applications. Its extensible platform seamlessly authenticates and secures more than 2.5 billion logins per month, making it loved by developers and trusted by global enterprises. The company&apos;s U.S. headquarters in Bellevue, WA, and additional offices in Buenos Aires, London, Tokyo, and Sydney, support its global customers that are located in 70+ countries. Application Type: "Single Page Web App"
Add http://localhost:3000/callback to the Allowed Callback URLs field. Add http://localhost:3000/ to the Allowed Logout URLs. For security reasons, after the login and logout processes, Auth0 will only redirect users to the URLs you register in these two fields. After updating the configuration, scroll to the bottom of the page, and click Save Changes. For now, leave this page open. Note: In the code above, you will have to replace <YOURAUTH0DOMAIN> and <YOURAUTH0CLIENTID> (they both appear twice in the code) with the Domain and Client ID properties of your new Auth0 Application. You can get these properties from the page that you left open. handleAuthentication: You will call this function right after Auth0 redirects your users back to your app. At this moment, the function will fetch their idToken and profile (a.k.a., idTokenPayload) and send this information to whatever is listening to the promise that it returns. signIn and signOut: These functions, as their names state, will initiate the login and logout processes. As you can see, when your app renders this component, it will check whether there is a user object available in the store or not (the component connects to Redux). If there is no user, it will use the handleAuthenticationCallback action creator to dispatch the HANDLEAUTHENTICATIONCALLBACK action. If there is a user, it will redirect them to your home page. Here you are defining two new sagas. The first one, parseHash, will call and wait for the result of the handleAuthentication function. Then it will put a USERPROFILELOADED action to let Redux know about the user who just signed in. The second one, handleAuthenticationCallback, is there to "listen" to HANDLEAUTHENTICATIONCALLBACK actions so it can trigger the first saga. Lastly, you are updating the rootSaga to make the handleAuthenticationCallback saga run when the app starts. This new version is adding a case statement to handle USERPROFILE_LOADED actions. That is, when your saga informs Redux that the user logged in, the code in this statement will add the user object to your app&apos;s state. With this change, you are making the navigation bar aware of the state of the user. If there is a logged-in user, then the app will show a logout button, the user profile picture, and their email address. If the user is not logged-in, the app will show a login button. After this last change, if you rerun your application (npm start), you will be able to log in and log out from it with the help of Auth0. Easy, right? 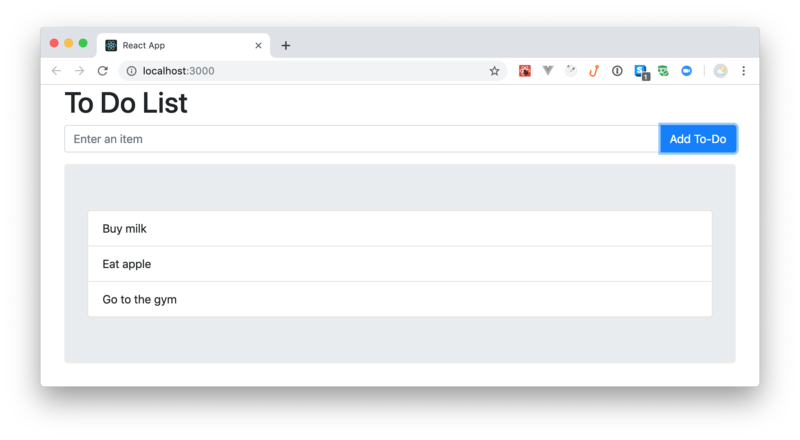 "Scaffolding a React SPA with React Router, Redux, Redux Saga, and React Bootstrap is easy." After configuring these libraries, you can rest assured that your next React application will rely on a mature and battle-tested architecture that can grow indefinitely.